Based in Germany or a nearby region and not happy with your website’s current hosting provider’s VPS solution? Are you underestimating how your hosts location impacts your website’s performance? Maybe it’s time to look for a service closer to home. One without the latency, down time, or a lack of features. While Germany’s internet infrastructure may not be on the same level as that of tech titans like South Korea or Hong Kong, the country has made significant strides in recent years to improve their telecommunication systems, and this progress is only expected to continue upwards. Here’s the rundown on Germany’s current internet state, and how it plays a part in German hosting solutions. Most of Germany’s internet is accessed through DSL technology. Fiber-optic cable highways – which are at least 20 times faster than standard DSL connections – make up a mere 1% of Germany’s internet coverage. This is incredibly low. Luckily, the areas that do utilize fiber-optic cables – mostly larger cities – offer data speeds ranging between 10 and 200 Mbps. Most of the blame for Germany’s lackluster internet infrastructure can be placed on Deutsche Telekom. Deutsche Telekom was once a government-owned corporation which served as the only internet service provider for German citizens. The company also took measures to delay the construction of fiber-optic cable networks for as long as possible. It wasn’t until after its privatization that pressure from regulatory agencies forced Deutsche Telekom to sell its DSL cable network. After Telekom’s monopolization ended, more ISP’s entered the country and internet access technologies grew. Today, the German government is taking steps to improve its internet infrastructure. It plans to invest 10 billion euros into broadband expansion. The ultimate goal is to hook every German household up to a 50 Mbps internet connection by 2018. Government aside, much of the investment will come from the Ministry of Transport and Digital Infrastructure’s “network alliance for a digital Germany”, a group of trade federations and telecommunication companies. This will help connect rural areas, bring more ISP’s, and expand its fiber-optic grid. With all this said, Germany is still considered one of the preferred offshore hosting locations. Just make sure a host is located in a larger city where faster internet access is more prevalent, such as in Frankfurt or Munich. 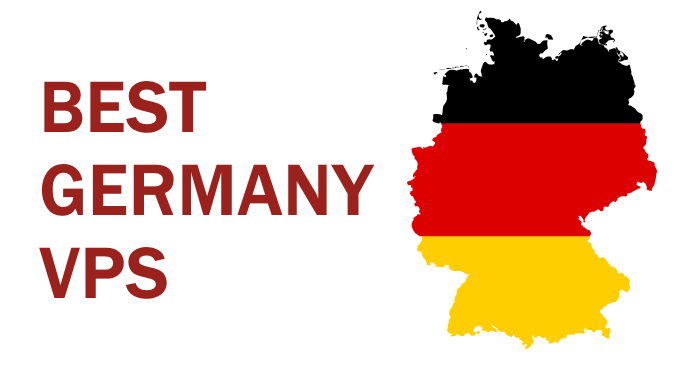 Here’s our list of the best Germany VPS hosting providers and their prices. VPS.net was launched in 2009 and is a subsidiary of UK2Group formed in 1998. VPS.net has offices in 8 countries where it focuses on offering cloud-based hosting solutions. The company has access to 14 different data centers across 4 continents. They offer both Cloud and SSD VPS solutions, though only their Cloud VPS hosting packages are applicable with their German location. Although their prices may not be conducive to users on a budget, VPS.net does have something to offer web-heavy users. By adding a Power Pack to your VPS, you get a larger service for a smaller price by effectively doubling your RAM and CPU when the traffic load is high. Power Packs also come with unmetered bandwidth and free “Server Density” monitoring – both of which any large website can appreciate. MegaHoster is a Netherlands-based hosting company formed in 2004. Through their 6 European and US data centers, MegaHoster is able to effectively service its thousands of customers. Their German VPS solutions run through the Telehouse data center, which utilizes SAN storage and RAID 10 technology. MegaHoster does offer a decent amount of storage space for the price, but we wish they offered more bandwidth and SSD servers. It also appears that MegaHoster does not allow VPS plan customization’s, so this German VPS provider may not be the best choice for traffic-heavy websites. But overall, good prices. GigaTux was established in 2007. Their main office is located in London, England, where their primary data center is also located. Their other data centers are located in Chicago and San Jose, USA, and Frankfurt, Germany. The company focuses on providing quality VPS solutions and has received 8 industry accolades from several websites and industry figures. Each VPS can run on Linux or Windows OS. Unfortunately GigaTux does not provide a free control panel. cPanel costs an additional $14.99 per month while a DirectAdmin license costs an extra $5.99. Although their servers are not upgraded with SSD, their prices are solid and German VPS plans can be easily customized. Contabo was founded in 2003 by Michael Herpich and Michael Bolke and is based in Munich, Germany. Contabo owns their equipment and maintains their own servers within two data centers located in Munich and Nuremberg, Germany. Not only do they own and operate their own servers, but Contabo also uses the latest technology. Each VPS comes with multiple CPU units, large amounts of memory and storage, and incredibly low prices. Superb Germany VPS provider, locally owned. Onvirt is based in Krailling, Germany and appears to be a one-man operation. It also appears that Onvirt only offers Germany VPS solutions, which features KVM virtualization technology, RAID 10 equipped SSD storage, and the latest Intel Xeon E5 processors. Onvirt only includes Linux and custom operating systems within their VPS packages. But overall, Onvirt offers the latest cloud hosting technologies at the lowest possible monthly prices. They offer a total of 7 Germany VPS plans, each of which can further customized to match individual needs. If you’re looking to get setup online fast with something simple, then Onvirt may be the right choice for you. XsServer was founded in 2008 and specializes in providing premier European VPS and dedicated server solutions. XsServer utilizes data centers located in the Netherlands and Germany. They offer Windows and Linux OS on their VPS plans. Each VPS client gets 1 free dedicated IP address and their choice of cPanel, DirectAdmin, or Plesk. Extra memory, storage, and bandwidth can be added as needed. Great hosting solution with lots of freebies. ScopeHosts was initially founded in 2008. Today, the company serves over 7,000 global customers and has direct access to several Tier-3 data centers in the Netherlands, Russia, and Germany. Their German center is located in Frankfurt where each VPS is mounted on Intel Xeon Quad Core Servers and equipped with RAID 10 hard drives within the OpenVZ virtualization platform. ScopeHost’s larger VPS packages are ideal for medium size web projects that require large amounts of storage space. Their prices are competitive, although we only wish they provided users with a free control panel and more customization options. VPS9 is a leading global VPS hosting provider first established in 2010. The company is registered in India and maintains servers within 3 data centers located in the Netherlands, Russia, and Germany. Their Germany VPS solutions can be managed or self-managed, and can run on Linux or Windows OS. Their Germany VPS packages can run on either Open VZ or Xen virtualization technology. Each VPS comes with a free SolusVM control panel, 1 dedicated IP, and has full root access. Additional SSD storage space can be added for an extra $3 a month per 10 GB. Hetzner.de is another locally-owned German hosting provider offering shared hosting, VPS, dedicated server, and colocation solutions. Non-German speaking individuals may have a hard time acquiring specific information on this web host since their website is written purely in German, but luckily their VPS plans are pretty straightforward. So what if you can’t read German! Cutting costs is a universal language, and by using Hetzner.de as your German VPS provider, you’re doing exactly that – paying less for more. SchnellNo, a word play on “Schnell Node”, was established in 2013. They use state of the art hosting technology, which includes Intel E5-2680 CPU’s, SuperMicro servers equipped with incredibly fast SSD’s stocked with RAID 10 arrays, and DDR3 RAM. SchnellNo’s VPS solutions are available with both Windows and Linux OS. When looking at SchnellNo’s German VPS’s, it quickly becomes clear that they offer packages that cater to all web projects of any size. Whether you’re looking for something cheap and reliable or customizeable and powerful, SchnellNo’s bound to have the perfect German VPS solution for you. Highly recommended provider. Cinfu was established in 2011 and is owned by Closco Ltd., which is a registered company in the Seychelles Islands. Available VPS hosting locations include Germany, Bulgaria, France, Netherlands, and USA. They accept Bitcoin. These servers run on OpenVZ virtualization technology and come with full root access. We only wish Cinfu provided a free control panel and SSD storage. Cinfu’s VPS prices are decent, but this probably isn’t the best hosting provider if you’re running a high-traffic business website. Host1Plus is a highly credible company founded in 2008. They claim to be the preferred hosting solution to over 60,000 customers worldwide, and have access to 8 data center locations, including in Brazil, Germany, Lithuania, South Africa, the Netherlands, the US, and the UK. Host1Plus’s VPS prices are excellent. Each plan comes with enough memory, storage space, and power to tackle everything from small email servers to large highly active message boards. Although we do wish the company provided more customization options, Host1Plus is a formidable German VPS hosting provider gaining widespread popularity for good reason – their services are some of the best in the industry.